One of the things that we’ve learned when we look at shipwrecks in particular but other parts of archaeology is when something is preserved, when it’s set aside, it’s almost like money that you put in the bank. But it’s money that you can’t make another deposit to. Once you start taking it out, it’s gone forever. That’s why as archaeologists, we’re very careful to look and not touch, more often than not. In the time I’ve been an archaeologist, I’ve seen the technology change so much that if I could go back and say, “Hold on! Don’t dig that ship up now! Let’s wait thirty years or forty years because we’ll learn twice as much!” I would go back and have that conversation with myself and others. 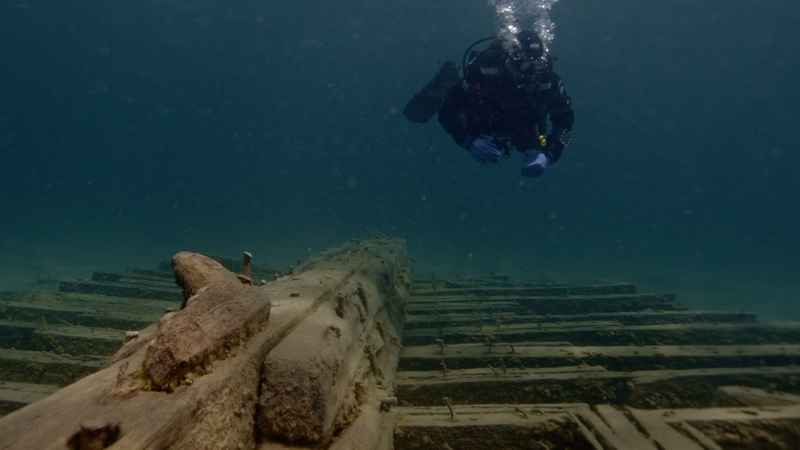 But by the same token, too, what we also learn is that these shipwrecks not only are repositories of the past, they’re people’s graves in some cases. They’re also wonderful marine habitats, full of life. So why should I as an archaeologist got to the bottom and say, “OK, we’re gonna take all of this marine life off, we’re gonna take away this home for all these fish, and we’re going to bring it to the surface,” when it’s there sitting as an untouched museum, that meets all of those needs, or that’s a beautiful place for divers to go and visit. That’s why we have sanctuaries. That’s why we set these areas aside. It’s not to just go and take. It’s to look, to observe, to appreciate, and in a few cases, if it’s that important, to intervene, take maybe this or that. A doctor, when he operates, doesn’t take everything out of you, he might take a little biopsy as a sample to learn what’s making you sick. And so that’s how we approach it with shipwrecks. That’s how we approach it with most anything in a marine sanctuary. They are sanctuaries, they’re conservation areas, they’re sentinels that speak to how we are changing the oceans and how we’re also working very hard to save the oceans and preserve what’s in them. So for the most part, we leave only bubbles and take only photographs.